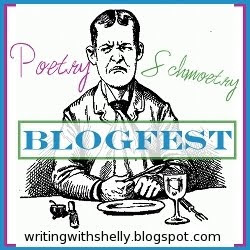 Here is my entry for the Poetry Schmoetry Blogfest that is being ran by Shelly Brown, the winner of my 50 follower contest. Poetry isn't my common M.O., but I promised I would participate. She recently did a review on Tyler Whitesides, who is coming out with a book called Janitors Since I finished reading and enjoying it just the other day I figured I would base my poem as a review of his book. Instead of a boring ol’ essay. That this entertaining book provides. And a scene with some cops. To fight warlocks who are against them. That leads him to dire straits. And turn them into fools. In this book he is there throughout. No doubt you’ll be a fan. Be truthful to those around you. To the story that is inside. I refused to read past the third stanza. Just like I cover my eyes during previews of movies that I already KNOW I want to see. I honestly tried my best to not blow anything. Hey! Just found your blog. I'm doing the same thing at the blog that I just started (http://getbetweenthebookends.blogspot.com). Documenting the journey of writer to author.